"It is hereby declared to be the policy of the President that there shall be equality of treatment and opportunity for all persons in the armed services without regard to race, color, religion, or national origin." Some historians regard this change as second only to the development of nuclear weapons in significance. For more information about the chain of events that led to the signing of Executive Order 9981, please visit the Truman Presidential Library Website. During the recent USSVI Razorback Base work day aboard Razorback, a number of important projects were at least worked on, and several were completed. The Turkish Navy, having smaller manpower requirements, usually sailed with fewer officers, and the Junior Officer's Stateroom was outfitted with only TWO bunks (the middle bunk was "pancaked down" onto the lower bunk. AIMM wants to thank the many base members who helped out during the work day. 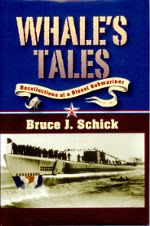 The book Whale's Tales by former Razorback officer Bruce Schick is back in stock. Bruce tells us this is the last carton of books, so when these are gone, they're gone. We would like to thank Bruce for his extremely generous donation of these books. 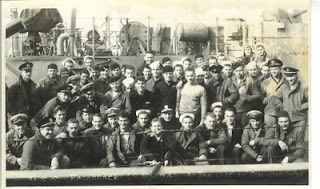 This picture shows Razorback's crew on 31 January 1948, during a visit to the port of Tsingtao (today known as Qingdao) China. At the time, the United States Navy was actively involved in training sailors of the Nationalist Chinese Navy. Thanks to the generous donation of a personal artifact from a submariner, AIMM's visitors now get a dramatic, hands-on lesson in submarine construction. The piece of pressure hull on the left is from USS Razorback. It was removed during the installation of the Air Conditioning units last year. The piece of pressure hull on the right is from USS Skipjack (SSN-585). 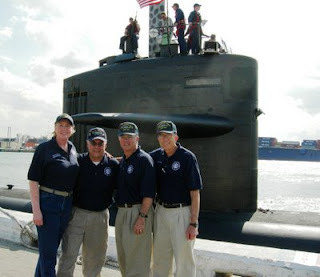 It was cut when Skipjack was recycled through the U.S. Navy's Submarine Recycling Program in the late 1990's. The different in hull thickness is obvious. When you hold each piece in your hand, the difference in weight is equally impressive, and our visitors are enjoying the new exhibit. Steve Nawojczyk, formerly of the Mayor's Office of Youth Services and long time AIMM supporter, is recovering from double bypass surgery today. Please join us in wishing Steve a speedy recovery. Update - Friday, July4th - 4:33 p.m. - Steve is up and around, but says he "hurts".